What Does “Building Green” Mean? Our green certified homes incorporate environmental considerations and resource efficiency into every step of the building and development process in order to minimize the environmental impact on our growing city. The design, construction, and operation of a home must focus on energy and water efficiency, resource efficient building design and materials, indoor environmental quality, and must take into consideration the home's overall impact on the Las Cruces environment. Some of the most energy-efficient areas of the home are: appliances, windows, insulated concrete walls (ICFs), and water heating systems. Using those which have ENERGY STAR® ratings decreases the amount of energy used in your home. This should also include efficient lighting fixtures and bulbs. The overall energy consumption within your home is further decreased by using renewable energy sources, such as tankless water heating systems and photovoltaic electricity. In order to conserve our precious water in the desert, we use fixtures and appliances such as low-flow showerheads, faucets, and toilets, and ENERGY STAR dishwashers and washing machines, which all conserve water. We also conserve water by the use of programmed, low-volume irrigation systems, rainwater collection systems, wastewater treatment systems, and hot water recirculation systems. Your decisions—from floor plan layout, to home size, to orientation on the lot—are made by a solid customer/builder relationship in considering the design of your home and development of your land. The house orientation and design will take advantage of natural daylight to reduce lighting needs, and will use strategies to reduce heat gain in the summer and heat loss in the winter. Your home may even contain several renewable materials, including but not limited to, rapidly-renewable wood species such as bamboo, and recycled-content materials in your carpets, tiles, and concrete formulations. Appropriately sized heating, air conditioning and ventilation system (HVAC) is a must for an efficient and properly ventilated home. Fans in the kitchen and bathrooms should cycle fresh air inside, and release stale air. Low-VOC carpets, pads, paints and finishes and wall papers will be used as well. Great care is taken to preserve trees and other vegetation native to the Las Cruces area. Landscaping will contain plants that are appropriate for our arid, desert conditions. Also, plants should be grouped according to water needs. Driveways and other impermeable surfaces should be reduced as much as possible, and may be composed of gravel, permeable block pavers, grids, or other permeable systems. It's becoming harder and harder to meet client’s new expectations with the same old building technology - wood framing. So more and more builders and home buyers are turning to something new. 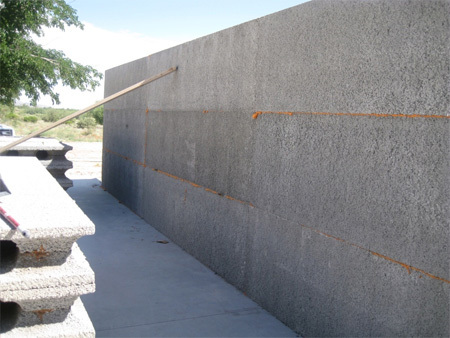 A modern adaptation of a centuries-old technology using the most proven building material on earth. Concrete. 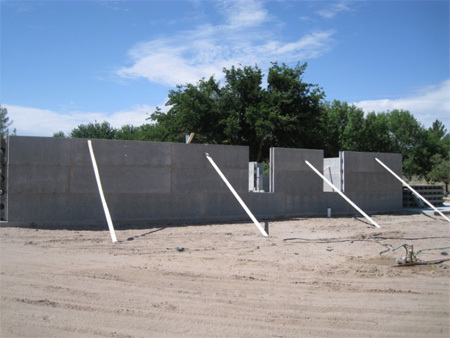 Insulating Concrete Forms (ICFs) give you all the benefits that have made concrete the material of choice for home building worldwide: Solid, lasting construction that resists the ravages of fire, wind, and Father Time. But ICFs do plain concrete one better - or rather, two better - by giving you two built-in layers of foam insulation. Please click here for a link to an article about New Mexico being one of top 10 in nation for commercial green LEED building. Please click here for an article from The Las Cruces Bulletin named The Big Bad Wolf Won't Blow this House Down.